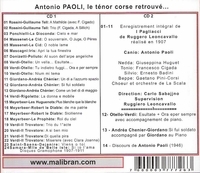 Antonio PAOLI was born in Puerto Rico, studied in Spain, and made his operatic d�but in Bari in 1895. In 1902-1903 he belonged to an opera troupe assembled by Mascagni that toured the USA and Canada. He frequently toured South America and in 1920 spent a season in Chicago, New York, and Philadelphia. He eventually returned to Puerto Rico to teach. His only recordings were for HMV in Milan. Gaetano PINI-CORSI, brother of the baritone, Antonio Pini-Corsi, sang for twenty seasons at the opera house in Catania and between 1892 and 1906 was regularly heard at La Scala. He sang many character parts including Mime in SIEGFRIED and Goro in the world premiere of MADAMA BUTTERFLY. He was still singing in 1932 but nothing could be discovered of his life beyond that. His recordings were for HMV in Milan. Paoli was known at the height of his fame as �The King of Tenors and The Tenor of Kings�. He is considered to be the first Puerto Rican to reach international fame in the musical arts. Paoli has been recognized as �one of the most outstanding opera singers of all time�, and as one who had �one of the most lyric and powerful voices...superior even to his contemporary rival, Enrico Caruso�. Paoli was also the first operatic artist to record an entire opera when he participated in a performance of PAGLIACCI in Milan, in 1907. Paoli continued to perform around the world with performances in Greece, Palestine, Poland, Egypt, Spain and Italy, where he established his permanent residence. In 1910, the singer was signed as the First Tenor by La Scala, the most prestigious opera company in the world at the time. Paoli received a contract to inaugurate Teatro Col�n, in Buenos Aires, where he sang Otello. He also performed in Russia, Poland, Egypt, Hungary, Belgium, Cuba, Chile, Haiti, Colombia, Venezuela, Brazil, Canada, and the United States. Giuseppina HUGUET was born in Barcelona and made her d�but there in 1889. She sang in London, Paris, Milan, and Russia. She appeared at the New York Academy of Music for one season in 1898. She retired in 1912 and taught in Barcelona. She made recordings for G & T in 1903 and for HMV in 1908.